Earlier this summer I had a lengthy discussion about coleslaw with some friends, which basically boiled down to the fact that coleslaw can be good, but rarely is. We all agreed that we did not like coleslaw which was doused in a milky dressing, but rather prefer a small amount of vinegary dressing. 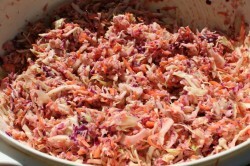 For this coleslaw, I used both green and red cabbage, and plenty of carrots. I had some leftover vegan sour cream (silken tofu, oil, lime juice, and rice wine vinegar), so I threw that in to make it a little bit creamy, along with plenty of salt & pepper, apple cider vinegar, a little bit of sugar, and a bunch of dried dill. The red cabbage kind of turns everything pink, so it doesn’t look too great, but it tasted quite good.